Paddy Japaljarri Sims "Munga Jukurrpa (Night Sky Dreaming)"
Editions of 100 by Basil Hall Editions. Presented in a special hardcover collector's folio. Total Print Size: 28 x 21 cm Image Size: 19cm x 14cm. Artwork Story Munga Jukurrpa (Night Sky Dreaming): The specific area depicted in this painting is Yanjilypiri. Yanjirlpiri,literally meaning a star, is the name of a group of hills west of Yuendumu, the country referred to in this painting. Yanjilpiri is associated with the initiation ceremonies of Japaljarri and Jungarrayi men. From Yanjilpiri the men travelled west as far as Lapilapi on the edge of Warlpiri country. 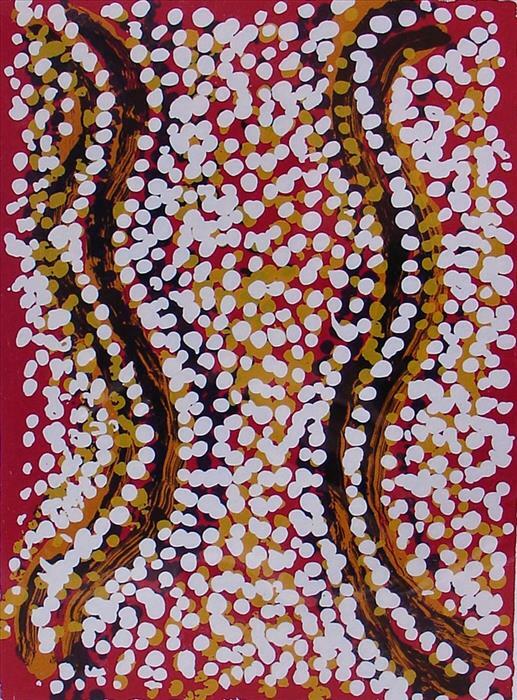 During the initiaion ceremonies men danced with spears and with the foliage of River Red Gums bound to their legs by Ngalyipi (snake vine). These are known as witi and are represented in this work by long straight lines. The stars underneath which the intitiates dance are shown as white circles.The Dreaming belongs to Japaljarri /Jungarrayi moiety.